#2 on Tv-Guide's Top 12 blind auditions of all time!! Anita Antoinette sits atop of the iTunes reggae charts. 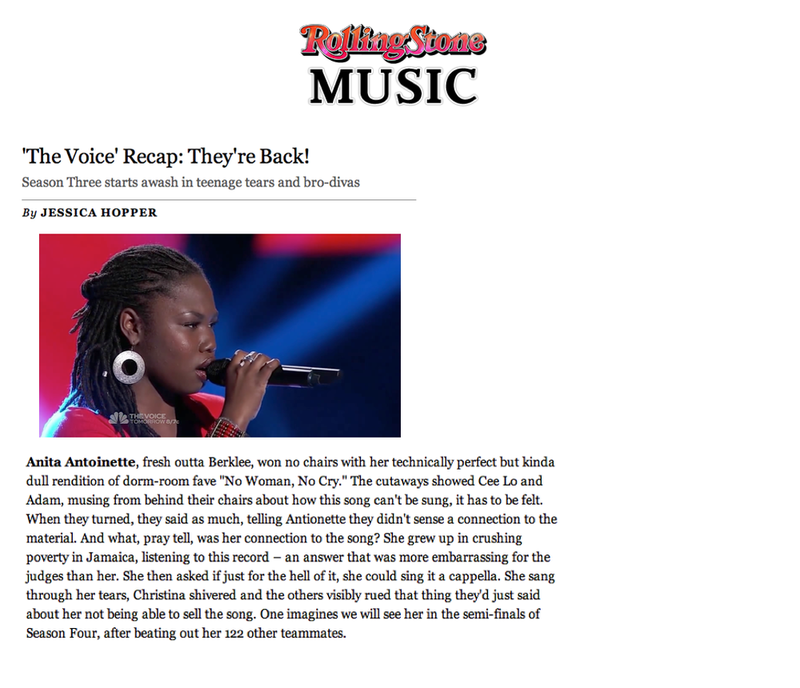 Her rendition of Magic!’s Rude sent her to the top of the charts and through to the live rounds of NBC’s The Voice . This, the singer’s second time in the competition sees her not only grabbing the number one spot, but also the #11 slot. Bob Marley’s & The Wailers’ Three Little Birds comes behind Anita’s cover at #2. Song choice on “The Voice” is tricky because it can make or break a finalist’s chances -- sometimes without any consideration to the actual performance. Night Two of the live playoffs offered some prime examples of good song choice strategy. Anita Antoinette’s version of “All About That Bass” showed what can happen when a hot song is done well, offering enough of a twist to make it her own, while keeping it likable. Anita Antoinette and The Voice Wildcard Rounds! It’s not over for Anita Antoinette! Island Stage and Reggae Reflection caught up with the Jamaican songstress for a quick conversation. Although her schedule is packed, preparing for The Voice Wildcard Rounds this upcoming Monday, December 8 and Tuesday, December 9th, Anita took time out to speak with us.